This Reference Article defines and explains the topic of Zebra print applicator settings found in any of the TEKLYNX label software applications (e.g. CODESOFT, LABELVIEW, and LABEL MATRIX). These appear in the TEKLYNX embedded driver (under the Environmental tab). 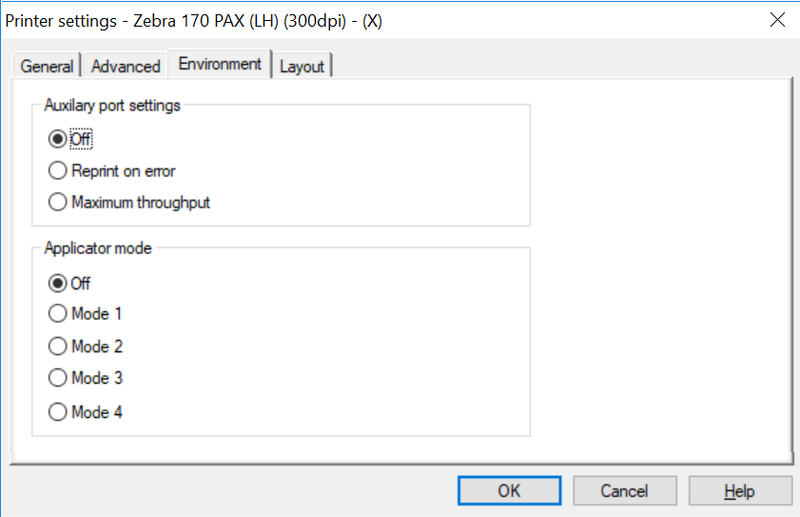 CODESOFT, LABELVIEW, or LABEL MATRIX, all using the same embedded Zebra print engine driver, can insert commands into the print engine to change it’s settings. These settings control how the print engine communications with the applicator through the Applicator Port (DB15). These settings ensure the print applicator and print engine communicate correctly. Note: Although TEKLYNX defines the first three radio buttons as “Auxiliary port settings“, the Zebra PAX4 print engine only has an Applicator Port. From our research, it appears all the settings on the Environment tab (i.e. 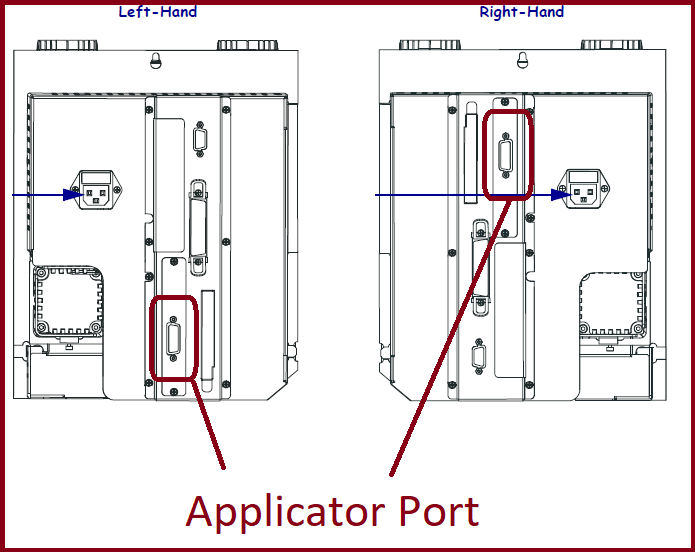 Auxiliary port settings and Applicator Mode) affect only the Applicator Port. This enables “Reprint Mode” in the Zebra print applicator. 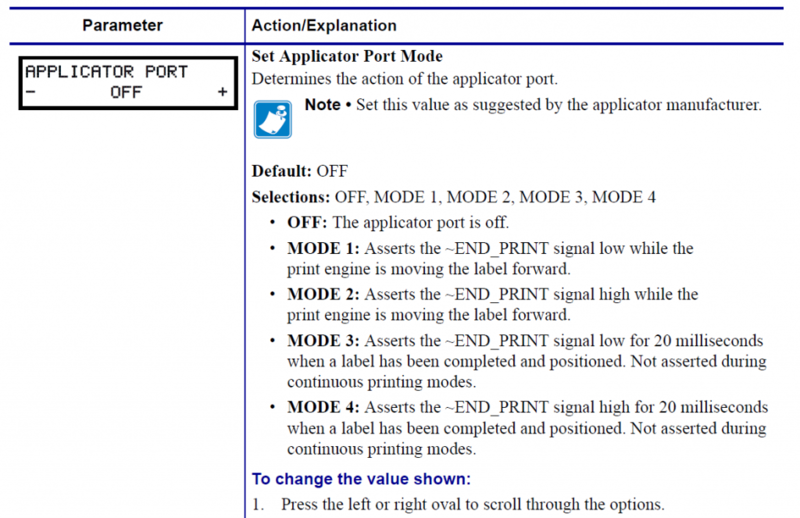 Reprint mode, when enabled, forces the print engine to reprint the last label when an input signal is detected on pin 6 in the Applicator Port. 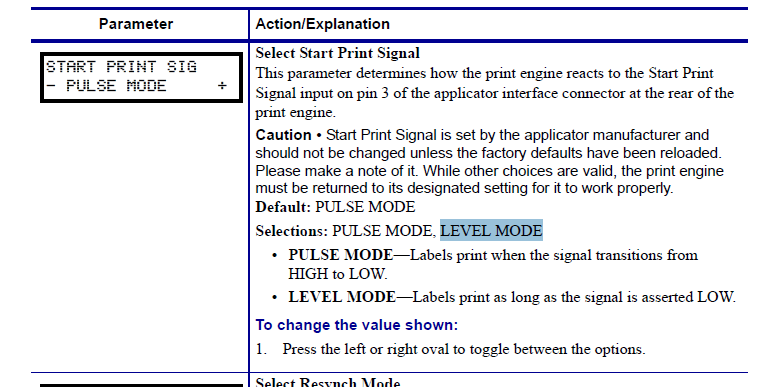 This setting likely sets the “Start Print Signal” to Level Mode. When in Level Mode, the printer does not wait for a signal on pin 3 to print the next label. This setting sets the “Applicator Print Mode” to OFF, MODE 1, MODE 2, MODE 3, or MODE 4. Each mode defines how the print engine signals an ‘End Print’ to the applicator. The End Print signal tells applicator that the print engine completed the label print. With this information, the applicator can then take the next steps needed to apply the label. The Mode number (1, 2, 3, or 4) defines the exact signal sequence the applicator can expect from the print engine on pin 11. The diagrams below show the normal sequence in the printing cycle (i.e. label format sent/received, process label format, wait for start signal, print label, and wait for next label). Note the signal pattern for pin 14 (data ready) and pin 3 (start print) are the same in all modes. The only difference is the End Print (pin 11) signal. Step 1 – Label Format Sent: Label information (i.e. print job) sent to the applicator on one of the communication ports: Ethernet, Serial, or Parallel from the label software (e.g. CODESOFT). Usually this data comes from a computer or server. The “Data Ready” (pin 14) signal is ‘not ready’, “Start Print” (pin 3) is set to ‘do not start’, and “End Print” (pin 11) will either be set to ‘do not end’ or ‘end’ depending on the Mode setting (i.e. 1, 2, 3, or 4). Step 2 – Label Format Processed: Print engine processes the label information and prepares for printing. No change in signals. Step 3 – Waiting for Start Print Signal: Print engine waits for applicator to signal it to start printing the label. This might occur when the applicator sensor detects a case or pallet approaching the applicator. During this wait, Data Ready goes to ‘ready’. Step 4 – Label Prints: Print engine prints the label. As it starts, the print Start Print signal goes to ‘start’ then back to ‘do not start’. The End Print signal behavior depends on the Mode setting. See the different options above. Each mode has a different End Print signal. The applicator will typically use the End Print signal to determine when to trigger the process of label placement (e.g. turn on air pressure, extend arm, blow label on container/pallet, retract arm). Step 5 – Ready for Next Label: Print engine waits for next label print job to come from the communication port (i.e. PC/server). 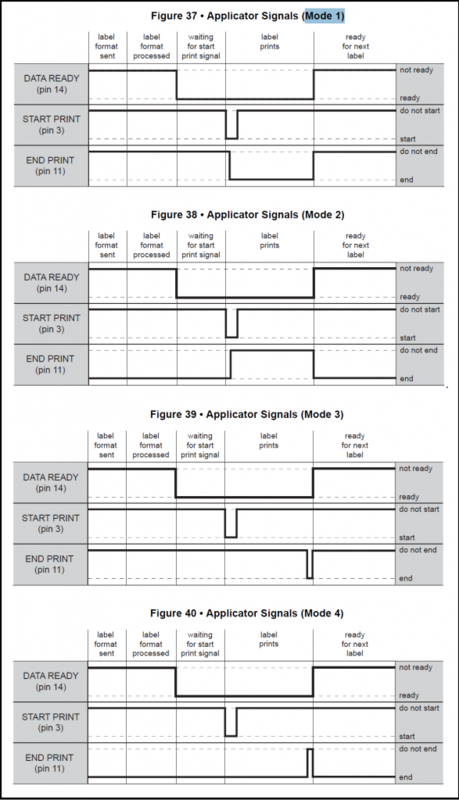 Data Ready signal goes back to ‘not ready’ and the End Print signal either goes to ‘do not end’ or ‘end’ based on Mode set.